Sophomore utility Jaleh Moaddeli throws the ball during Sunday's home game against Bucknell. Women’s water polo got an early look at what to expect during conference play in its three-game homestand this weekend. The Colonials (5–8, 0–1 CWPA) hosted three conference foes – No. 24 Bucknell, No. 14 Harvard and Saint Francis – in their only home games of the year, going 1–2 on the weekend. Second-year head coach Barry King said the weekend’s results, which did not count toward the team’s conference record, highlighted the team’s need to reduce turnovers and brush up on execution one week before the Colonials enter the thick of College Water Polo Association play. Bucknell and Harvard swept GW on Saturday, with the Colonials dropping the first contest 11–7 and the second contest 18–4 before picking up a 10–9 victory in their Sunday match against Saint Francis. With losses to Brown and Princeton in their sixth and seventh games of the season, the Colonials have already faced five of their six CWPA opponents in the non-league portion of their schedule, but they finished just 1–4 against those teams. 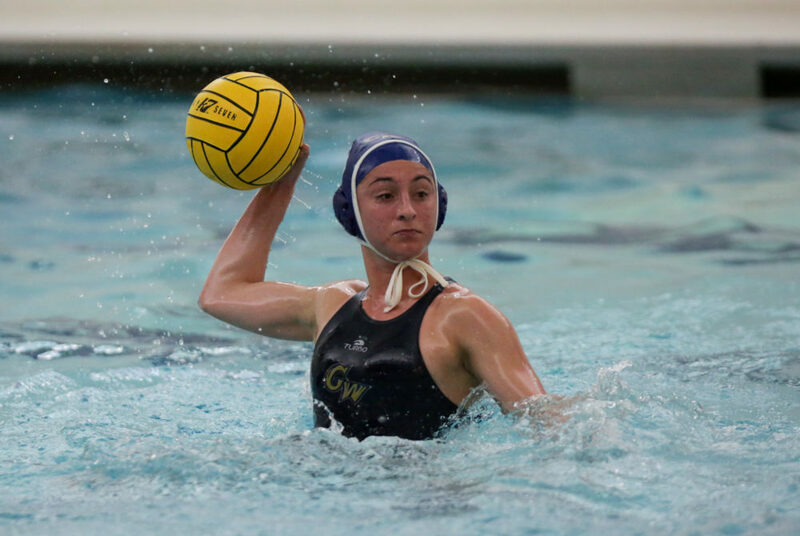 Sophomore utility player Alana Ponce said the ability to preview league foes helps them prepare for CWPA play, when the games start counting toward their conference record. “It helps us to get to know which players we need to look out for, and what we need to train for as far as speed or passing,” Ponce said. In Saturday morning’s 11–7 loss to Bucknell, GW trailed by just one goal early in the fourth quarter. A balanced attack featured four different Colonials on the scoresheet, but they were blanked for the final 6:10 of the fourth quarter as the Bison tallied three unanswered goals to put the game out of GW’s reach. “We’ve just got to get better at having good opportunities and at least making the goalkeeper make saves on it,” King said. Harvard blew out the Colonials 18–4 in the second game of Saturday’s doubleheader. The Crimson led 12–3 at halftime and jumped ahead 17–3 after three quarters in the contest, physically outmatching the Colonials. The loss was GW’s worst of the year by margin of defeat, as the Colonials had lost only one game by double-digits prior to Saturday night’s slip-up. King said the team was not prepared for Harvard’s physicality in the pool. “We’re pretty comfortable with not being physical, but now we got to step that up a little bit,” King said. He also said the team needed to improve ball security, especially against teams like Harvard that utilize the press on defense. “We’ll be focusing on possessing the ball against that hard press and not making mistakes with it in the middle of the pool that turn into 3–2 counter-attacks,” King said. Sunday’s contest against Saint Francis featured a last-second, game-winning buzzer beater by Ponce on an isolation play King drew up out of a timeout with eight seconds remaining. The Colonials showed their ability to execute winning plays in late-game situations around a player like Ponce, who scored four goals and had five steals in the weekend finale Sunday. Junior utility player Allison DeCicco, who tallied two goals and two assists on the weekend, said the close contests against Bucknell and Saint Francis helped boost the team’s confidence against conference competitors. In the next two weekends, the Colonials will get a chance to avenge some of their losses in rematches against Harvard, Bucknell, Brown and Saint Francis. GW will play Michigan in its season finale, the only team in the conference it has yet to face. King, who led GW to its best winning percentage in five years last season, said there is “a lot of material to go over” after the weekend’s games, but game results ultimately come down to the student-athletes finishing plays and trusting one another. The Colonials return to action Saturday against Harvard on the road. Swimoff is slated for 1 p.m.